Sony Digital Cinema and Sony Music bring unique music events to Apollo Cinemas | What Hi-Fi? Sony Digital Cinema and Sony Music are working to bring a range of 'music experiences' to cinemas as part of Apollo Cinema's "More" campaign. The aim is to deliver unique content that takes advantage of the latest cinema technology. 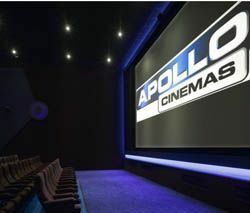 By summer 2011, all Apollo Cinemas will feature Sony 4K digital projectors and RealD 3D technology. The partnership was kick-started by the European premiere of Avril Lavigne's new album – don't get too excited – which featured a 3D video. Currently showing at Apollo Cinemas is a specially-made Sony 4K Technology trailer featuring sneak previews of new Sony content and soundtracked by Sony Music group, Magnetic Man. David McIntosh, director, Sony Professional Solutions, Europe, says: "This new partnership between Sony Music and Sony Digital Cinema shows our ambition and commitment to improving content in modern cinema."